All for ye' grog in this bloody fine pirate costume. The cotton shirt features a rugged weave and wide blue and white stripes. It has a wide collar, lace-up chest, and jagged sleeves. The polyester pants feature an identical jagged hem and a drawstring waist. A red headscarf and waist sash pull your look together. 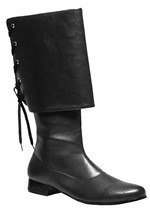 You'll be sure to get that pretty lass's attention when you add our black pirate boots.